"I'll make my own way through history!" Hwang Sung Kyung was the firstborn son of a poor but peaceful family. He grew up strong and healthy despite the warlike age, but his parents both died when he was very young. His memories of his parents were of brave people with a strong sense of justice. Their righteousness had been their downfall in this age of war and treachery, and their deaths were hard for Hwang to overcome. Hwang grew into a strong young man and decided that it was time for him to protect the people that had guarded him when he was young and alone. He enrolled himself into a dojo to learn the art of the long blade. Hwang had an uncanny talent for it, and he practiced as much as possible. It was not long before Hwang became the dojo's best student and he earned a private lesson from the school's master, Seung Han Myong. Master Seung was happy to have a talented student such as Hwang. Myong had a child, Seung Mina, who was a skilled martial artist herself. She was Master Seung's only child, and he wanted a son more than anything. He was seriously thinking about adopting Hwang as his son. Hwang did not learn of this until later because their homeland of Korea was suddenly threatened by Japanese forces. Japan had settled their civil war and was now preparing for foreign conquest. People rallied under the Sea Force admiral Le Shun Jin and prepared to defend Korea against the invasion. They started building fortresses along the coast lines. A Coast Guard was formed and Hwang was one of the first to volunteer. Those who were eager to save the motherland talked about the legendary Patriot Sword Soul Edge, which they had heard of from the West. 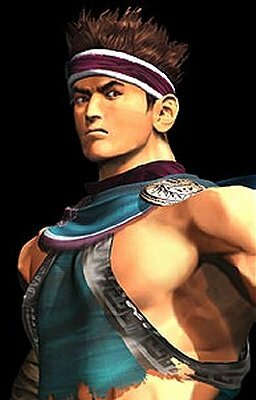 When Hwang's superiors heard of the sword, they ordered Hwang to travel to the west to find Soul Edge. With this sword, perhaps they could drive off the Japanese and save their country. On his way to the west, Hwang stopped by the dojo to bid farewell to Master Seung. Seung offered him his own sword, the Mountain Breaker, but Hwang decided to rely on his Blue Storm. Hwang left the dojo unaware that Seung's daughter Mina had overheard their conversation and would follow him a few days later. During his travel west, he encountered many warriors who were also seeking Soul Edge. With a map of Europe in his hands, he was getting closer to his destination every day. However, word reached him that Korea had finally been invaded and would soon fall. With this news, Hwang immediately abandoned his honored quest and returned home. During the return trip, he found Seung Mina and brought her home with him. When he arrived at the dojo, a worried Seung Han Myong thanked Hwang for returning his daughter. He then asked Hwang to become his son. Hwang was honored by Myong's offer, but felt that his place was on the front defending his country so he refused. Even though he had returned empty handed, he recieved a warm welcome from his comrades. He had become increasingly strong and wise during his journey, and he entered the war to protect his mother land displaying great bravery, justice, and patriotism. The battle raged for months, but Hwang remained strong. But one day, Hwang learned from a new recruit named Kong that Mina had run away from home again. The news troubled Hwang, but he knew that he could not forsake his duty protecting his country. Worry over Mina's safety and his impatience with the Japanese forces' cowardly tactics eventually caused Hwang to lose his inner calm. He made a horrible tactical mistake by chasing a small pirate ship and many lives under his command were lost. Admiral Lee Sun Shin summoned Hwang and dismissed his rank as commander of the Coastal Defense Force. Admiral Shin had come to consider Hwang a friend over the years, and he asked Hwang what was troubling him. The Admiral was also a friend of Seung Han Myong, so he sympathized with Hwang's concerns for Mina's safety. Thus, he sent Hwang on a new quest to find Soul Edge, with the real objective being the retrieval of Seung Mina. Hwang understood why Admiral Shin had demoted him and accepted the assignment without the slightest hesitation. He headed west once again to search for Mina. He caught up with Mina in Europe, who had come to the west to search for Soul Edge. She had learned the sword's true nature, and that it was a source of evil. Shocked about what had been the object of his search, Hwang decided that Korea need not rely on legends anymore, for he and others like him would protect their homeland. Having found Mina and fulfilled his true objective, Hwang returned to Korea to once again defend his country.